Home »Movies»Mind The Gap»Mind The Gap: You Haven’t Seen Fargo? Mind The Gap: You Haven’t Seen Fargo? We at Deadshirt like to fancy ourselves pretty dedicated to popular culture with a combined knowledge of all things media that borders on the encyclopedic, but no one is perfect. There’s just too much music, too many films, too many comics, and way too many television episodes out there. No longer will we have to harbor the secret shame of not having experienced an expected work. Here is where we fill in the missing gaps. 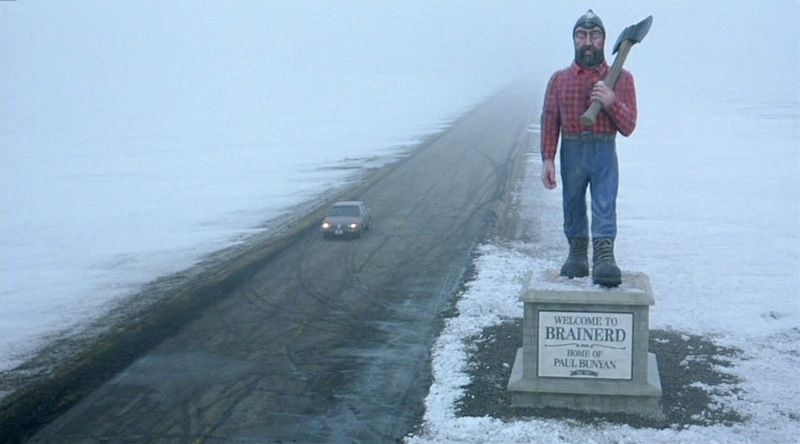 Like driving in a heavy blizzard, I wasn’t sure what the heck I’d be facing as I ventured into watching Fargo. It was a movie where I’d had a strange picture painted for me by everyone else who had seen it. I expected something funny – this movie has appeared on several best comedy lists since its release in 1996. I expected violence – my mom regularly warned that it was too violent for her current mood. I knew four other facts – there is someone going into a wood-chipper, there is a pregnant cop, there is some Minnesota nice with the “donncha know”-s and “oh jeeze”-s, and it has Steve Buscemi. These key points were the landmarks I spent my first viewing looking out for, when in retrospect, I should have just driven carefully and focused on the road in front of me, the film itself. 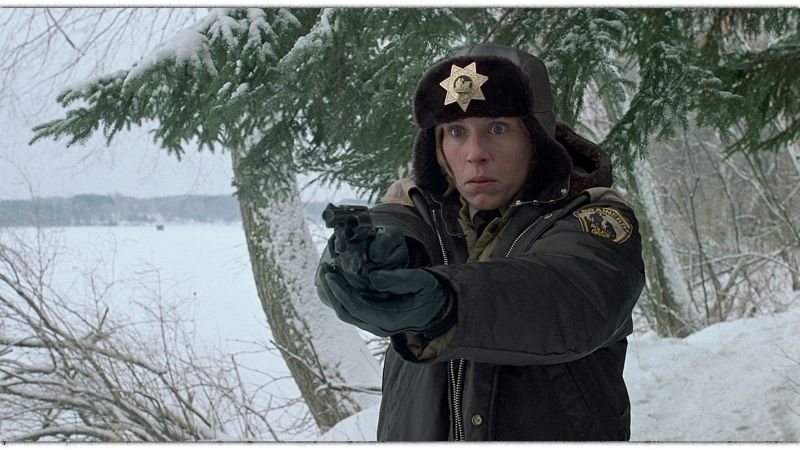 The first time I watched Fargo I expected the movie to be something it was not. I was expecting something more like the Coen Brothers’ later film, Burn After Reading, with its over-the-top characters, wildly farcical situations, and shockingly visceral violence. I let my expectations and preconceived notions lead me to ruin, for Fargo is decidedly NOT Burn After Reading. That is perfectly fine because it wasn’t going for the same feel, but coming to terms with the difference between my expectations and the film itself was difficult. Trying to hold Fargo, a well-constructed film that knows where it’s going, to the standards of a different film, was a bad idea. The first time I was plagued by wanting things to move faster and to ramp up more. I came away bothered by not having clear feelings on the film, because I wasn’t sure why I didn’t love it. First, a little on the plot for fellow new residents of Fargo. Jerry Lundegaard (William H. Macy), a car salesman, tries to get his wife kidnapped by Carl and Gaear, (two criminals played by Peter Stormare and the aforementioned Buscemi) so he can get money to buy a car lot of his own so he could provide for his family instead of living under his father-in-law’s shadow. His wife gets kidnapped as planned but Carl and Gaear end up killing two other people and increase their demands for ransom. We follow pregnant police investigator Marge Gunderson as she tries to piece together the various strands of this ridiculous series of wry, film noir events. The characters were interesting, many scenes were beautiful, and the cinematography was great. That bird shot in the opening that provides such an excellent and understated contrast to the snowstorm. Every scene in Jerry’s office where he seems trapped there with the blinds as prison bars, and even just the driving scenes where the characters seem to be the only ones alive and affecting the story, which is more or less true. It was fantastic. But despite everything that I liked about the movie, that first viewing didn’t click so I had to try and parse out why. The movie is dry, from the humor to the violence. The characters are all interesting and diverse, and the setting of a snow blanketed North Dakota makes all of the characters feel isolated. And that isn’t even getting into some of the cinematography and imagery that is used in the movie. Jerry’s office is also framed with vertical bars making it look like a prison cell, the parking lots with only our characters’ tire tracks there, and then just the endless fields reinforcing the ideas of isolation, and when you start looking at the movie from that angle it means sense. From that singular bird flying through the thick snow we get this idea that people are utterly alone in the movie. Carl is constantly trying to get real and human interaction from people ranging from Gaear to prostitutes, but his lack of social awareness prevents him from getting what he desires. At the same time, Jerry is in his own prison where he feels powerless and lonely despite having his wife and son. But he doesn’t feel like they belong to him since his ability to provide for them utterly depends on Wade. Meanwhile, Gaear has given in to the solitude, and it has driven him utterly mad so that anyone who intrudes upon it ends up dead. The only character who doesn’t seem to have this issue of being alone is Margie, which may be symbolized by the fact that she’s “with child,” so she’s never really alone. At the same time, she is the only one of the film’s main characters who shows love for other people, so she gets love back in return. Margie’s ability to trust people ends up being a hurdle for her to jump over. After she meets with Jerry, who flat out lies to her, she meets with Mike Yanagita, a former school friend who she decides to visit for lunch. Mike acts strangely from the beginning of their conversation, trying to sit close to Margie and flat out hitting on her, all the while seeming completely imbalanced. Without this idea of isolation and the effect it has on the film’s main characters, this scene seems incredibly random to be in the movie. 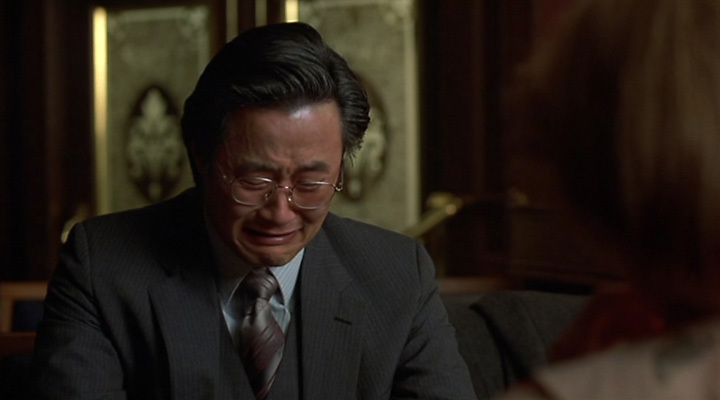 In fact, if you Google Mike Yanagita, it seems most people are confused about this scene and what it is there for. Later in the film we learn that Mike lied about everything and that he’s actually crazy. This is the scene where Margie realizes she can’t trust Mike, which sets up her meeting with Jerry again and the final acts of the movie. The theme of loneliness and its effects on people is easy to miss under the weird local color of the movie, especially if you go into it expecting something else. While I don’t love the movie as much as I wish I did, I love these parts of it and I find it fascinating to watch and discuss. Fargo does a lot of things incredibly well, and I sure as heck enjoy and appreciate it for what it is. Luke Herr is many things at many places, like a cat in a box factory in Shroedinger, Ohio. Mostly he does internet writing shenangians, comic script tomfoolery and sometimes deeply confessional and heartful work. Most of the time this work can be found linked at his portfolio page.